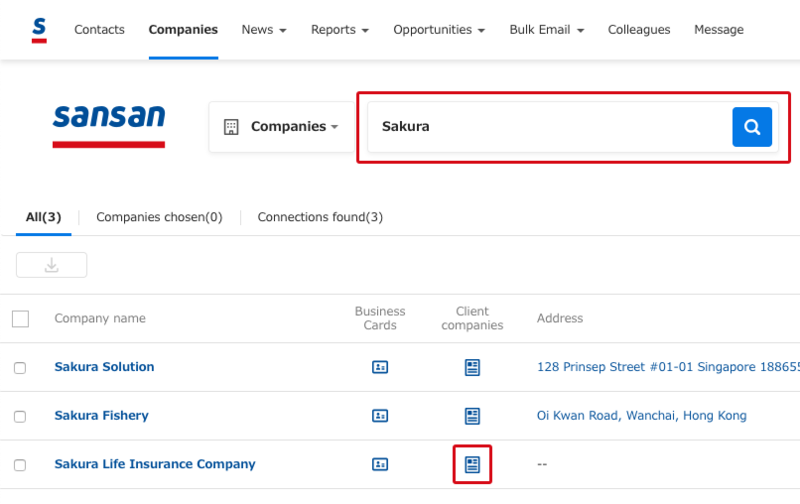 When you use Sansan, you can make approaches using connections you find from searching the business cards registered by your colleagues. However, when there is no direct connection between your company and the company you want to approach, by using the information displayed on the Client company screen, you can consider making an approach via a client company of the target company. From the Company screen, do a search for the name of the company that you are considering approaching. When you find the target company, click on the "Client company" icon. Check the companies displayed on the Client company screen, and consider using a company you do business with to make the approach. If you find someone who might be of use, click on that person's business card, and you can send a message to your colleague to ask them for introduction to this person. 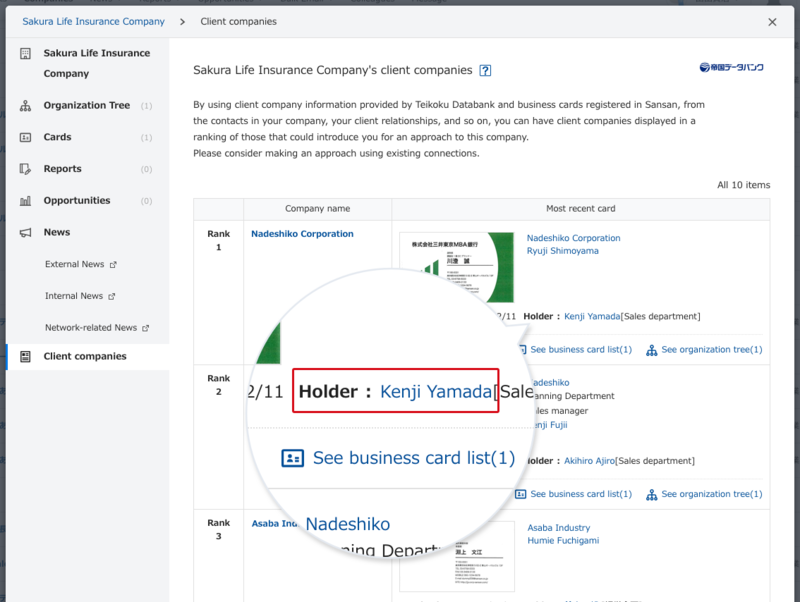 The information displayed on the Client company screen uses both client company information provided by Teikoku Databank and business cards registered in Sansan. They are displayed in a ranking based on the possibility that an introduction for an approach to that company can be made using the connections inside your company and client relationships. The determination of the display rank makes use of an estimated value based on a model proposed by Misako Takayasu, an associate professor at the graduate school of the Tokyo Institute of Technology. They are displayed with companies with the higher estimated turnover at the top. The company names of Client companies are displayed. Business cards of a company that merged or changed names for some other reason will also be displayed. 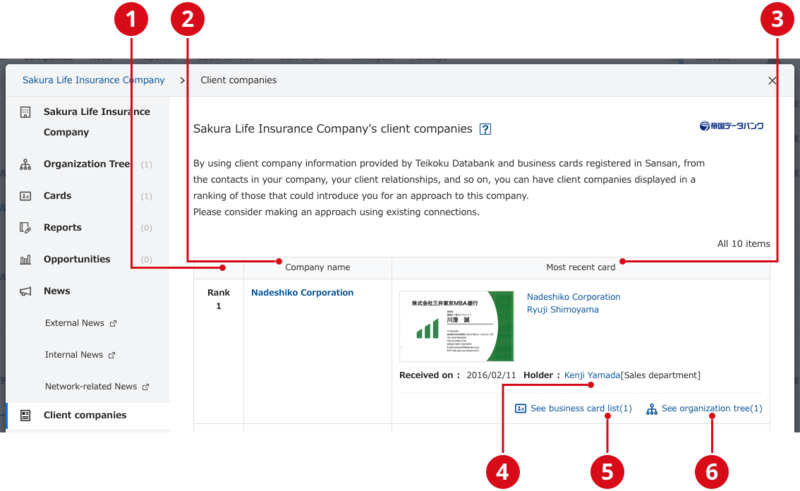 The contacts of the Client company and inside your company are displayed. The business card with the most recent date received will be displayed. Names of colleagues who have contacts will be displayed. If you click one of these, you will be brought to this colleague's profile. This will bring you to the Business card list screen of the Client company. This will bring you to the Organization tree screen of the Client company. Q. Can we check the actual turnover? A. You can check only the ranking based on an estimate made of the turnover. Q. There is nothing displayed on the list. A. In the list are displayed only the companies that your company has contacts with. If your company has no business cards of the companies that do business with the company in question, nothing will be displayed. Make sure that all the business cards you have are registered into Sansan, and try to make use of the contacts that you already have.